We used a limited dataset of English words as text data to evaluate and manipulate, and I’ve created a GitHub gist of XML input and XQuery code for use with this tutorial. let $delimiter := " "
As before, our XQuery code above returns undesired results for compound words like ‘Governor General’, which are found in our external XML data file more-compound-words.xml. 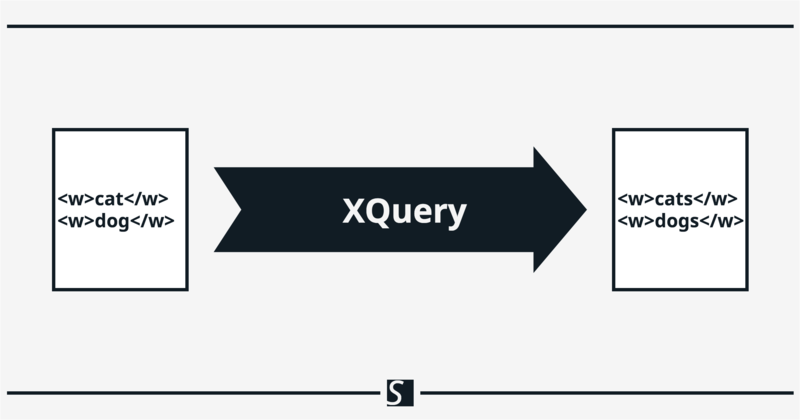 To return our desired result, we use a conditional expression and the XQuery string function fn:contains() to determine if the text content of each <word> element, $compound-word, contains a space. If $compound-word does contain a space then fn:contains($compound-word, $delimiter) returns true. From here — based on our dataset — we declare the variable $compound-head and use fn:substring-before() to assign it the string value of the leftmost word in each compound (i.e., all characters preceding $delimiter in $compound-word). Finally, we replace $compound-head with the result of fn:concat($compound-head, $plural-suffix) using fn:replace().